Obvious Child, the first ever abortion rom-com opens in UK cinemas today. Read Sophie’s entire review and comment. The film opens in cinemas nationwide today. 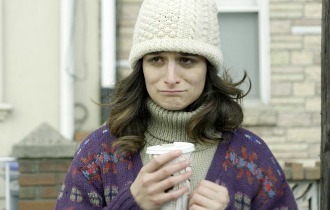 The picture is still from the film, with Jenny Slate as Donna, looking unhappy and drinking coffee. Taken from Obvious Child UK Facebook page.